Today is the first week where my family is returning to the practice of abstaining from meat on Fridays. When I touched on this topic a few weeks ago, I pointed out a timely article by Matt Fradd where he explains his reasons for continuing to perform this practice post-Lent. Here, I would like to take the baton from him and explain what led our family to return to this practice. 23. Friday should be in each week something of what Lent is in the entire year. For this reason we urge all to prepare for that weekly Easter that comes with each Sunday by freely making of every Friday a day of self-denial and mortification in prayerful remembrance of the passion of Jesus Christ. We shall thus freely and out of love for Christ Crucified show our solidarity with the generations of believers to whom this practice frequently became,especially in times of persecution and of great poverty,no mean evidence of fidelity to Christ and His Church. We shall thus also remind ourselves that as Christians, although immersed in the world and sharing its life, we must preserve a saving and necessary difference from the spirit of the world. Our deliberate,personal abstinence from meat, more especially because no longer required by law, will be an outward sign of inward spiritual values that we cherish. So in summary: they have abolished the binding practice of abstaining from meat (i.e. you don’t have to and it’s not sinful if you do), but they clearly have the hope or intention of individual Catholics continuing the practice or replacing it with some other visible outward sign of our values. Like I mentioned in my last article, this all came about because of a few inklings I had of continuing this practice. Matt Fradd’s article came along right around the same time to really drive the point home, and it started a conversation between my wife and I where I discovered that was considering the exact same thing. A lot of tumblers clicked into place and we decided that we would re-enact this practice in our house after Pentecost when the celebratory season of Easter is over. I had the opportunity to speak to my priest about this, where he also explained that individual Catholics have been called to replace the abstinence from meat with something else if they choose not to practice it. He explained that he would go and visit the poor and the homebound each week, sacrificing his time instead. I already volunteer a lot of my time in a variety of activities, and my priest’s comment made me consider whether I could just earmark one of those activities as my sacrificed time to satisfy the abstinence/penance requirement. After reflecting on this idea, I came to realize that I don’t do any of those things sacrificially… I actually enjoy serving our parish community in those ways so to me it wasn’t internally consistent to “count” those things. Furthermore, I enjoy the Lenten practice of doing something that causes me to take pause and reflect on why I’m doing it. I enjoy praying the rosary because it takes me through the mysteries of Christ’s life and this practice is a way to reflect on the Sorrowful Mysteries one day each week. Lastly, I like the sentiments expressed by Section 24.b above. Abstaining from meat is an outward sign of my internal spiritual values. Every Lent I get to respond to the questions about why we abstain from meat, why can you still eat fish, and so on… this continues that visible practice in such a way that it gets noticed by people. It gives me a chance to evangelize with my actions and it has regularly started a discussion about my Catholic faith. Sacrificing a cheeseburger is a small price to pay if it eventually leads someone closer to Christ. I’m going to heat up my cheese quesadilla now! As we discussed last week, here are some ideas for keeping the celebration of Easter near and dear to your heart. This year, I aimed to do more spiritual reading during Lent. I was able to succeed in this, however one of my more ambitious goals was to get through Saint Thomas Aquinas’s Summa Theologica. Let’s just say that I bit off more than I could chew with that tremendous work. I have decided to continue my efforts, and I think it is more reasonable to aim to complete this book by the time next Lent rolls around! What’s this do for you: well, for me it keeps me focused on deepening my faith. In addition, I will continue reading other Catholic works such as Pope Benedict’s Jesus of Nazareth series. It’s a great way to understand Christ’s life, what better way to celebrate the season of Easter! One of my favorite apologists, Matt Fradd, has decided to continue abstaining from meat on Fridays beyond Lent. This started a discussion in our household, because I was already thinking about doing this same thing (since it is still present in Canon Law after all). Interestingly, my wife was also considering a continuance of this beyond Lent so we decided that after Pentecost we are going to keep going with no meat Fridays in our house. What’s this do for you: it keeps an appropriately penitential spirit throughout the year. I found that during Lent, I would often remember that it was “no-meat Friday” and think about Christ’s Passion and what he gave up for us. Why are we waiting until after Pentecost to start this? Because we figure Easter is a time of celebration and it seems like as good a time as any. With Easter being a season of celebration, it is no better time to do some course-setting for the upcoming year. Several different sources have suggested some manner of a spiritual development plan for your family: prayers to do, observances to keep (like no-meat Fridays! ), Catholic movies or books to consume… even as far as to create a Family Mission Statement that encompasses what your family wants to be about spiritually. Do you want to help the poor? Then your family mission statement should say so and you should take actions during the year to help the poor. Do you want to deepen your faith? Then you might focus on watching spiritual movies and reading more books this year. This is particularly valuable if you have children that are old enough to participate as well so you can help them develop their understanding of the faith better. What’s this do for you: this helps you act as the spiritual head of the family. This will help you get “on the same page” as your spouse, lead your children with a proper formation, and provide a great example for other families. You can apply this same concept to your parish or Church community as well. A great example of this is participating in social programs that are designed to bring people together to discuss their faith and evangelize together. I am positive that your parish probably has more events than you know of going on, so check with your parish priest or activities director to find out what you can do to get involved. If you happen to be in a rare parish that doesn’t have anything going on, you can increase your spiritual development by simply attending Mass more, or attending your normal Mass and taking one step out of your way to speak to parishoners around you after Mass. You might make a friend and get to know someone better! Some Churches even run evangelization programs, where you can learn how to effectively share your faith with others. What’s this do for you: These activities help you get out beyond your own perspective and share the Faith with others. You’d be surprised how much you can learn if you just talk to some other members of the parish. They might know people in need, or be involved in an interesting program, or simply want to discuss today’s Gospel with you. It’s all good for you and good for the Church community. I hope that some of these ideas help you to celebrate Easter and carry on deepening your Faith all throughout the year! It’s nearly impossible not to sing a verse from The Righteous Brothers with that title, isn’t it? We’re coming up on the third Sunday of Easter and many people don’t seem to realize that it’s still Easter. That’s right, the Easter season (sometimes referred to as Eastertide) starts on Easter Sunday and lasts until Pentecost Sunday. Generally speaking, everyone acknowledges the importance of Easter Sunday but it seems attention and Mass attendance wanes the further away from Lent we get. Collectively, we all seem to do a pretty good job during the Lenten season… we give something up, stick to it (most of us), and recognize that we’re doing it in memory of Christ’s sacrifice for us. There’s extra observances to pay attention to like fasting on Fridays, extra activities like the Stations of the Cross, and it’s generally just easier to stay focused. But then, Easter Sunday rolls around and we all celebrate as well we should. Using our household as an example, we quickly return to the habit that we gave up for Lent despite the fact that we intended to keep it up for longer than just Lent. That “boom, it’s over!” mentality is part of what I think takes away from the impression that Easter Sunday should make. My wife, Tasha, and I were talking about this phenomenon. She commented that it helps her to keep focused on the joy of Easter by remembering the sorrowful part of the end of Lent. She imagines what it must have been like for Mary and the Apostles to see the Lord beaten, crucified, and buried and the sense of desperation and loss that must have gripped them. She noted how much easier it is for us because we had the rest of the story, we know the happy ending and we can take it for granted. I appreciate the Easter season because of all of the post-Resurrection appearances of Christ that we get to hear about. I love to reflect on the confusion and joy that is experienced by the Apostles. I love the accounts of Christ appearing on the road to Emmaus and the Sea of Tiberias in such a way where those that knew him on Earth initially don’t recognize him. It makes me stop and think if I would recognize Christ if he were to present himself like this to me. I put myself in the shoes of the Apostles and think about what it must have been like to behold Christ this way. What was next for these men? It was a life of travels, trials, persecution, and death. All but John were killed for preaching in the name of Christ. This is a testament to their experiences… this wasn’t just some hallucination to them. They didn’t make it up. They believed fervently enough to suffer and die for the Lord because they saw him both suffer and die in an earthly body and then return to them in a glorified body. The Easter season presents an opportunity to learn alongside these men what truly experiencing God is all about. Over the last few weeks, I have come across many resources that suggest using the Easter season to regroup and reform your spiritual life so that you can live out the year in a more faithful way. In my next article, we’ll look at a few of these ideas in detail. Stay tuned! Happy Easter to all! Today, the secular world marks a somewhat confusing holiday that celebrates rebirth and the fertility of Spring characterized by rabbits, flowers, and little marshmallow chicks. If you’re Catholic, however, you mark this day as the triumphant victory of our Lord Jesus Christ over death as he rose from the grave. 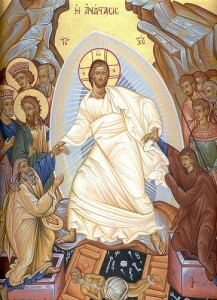 Many better theologians than I can (and have) filled volumes explaining the significance of this day, but our parish priest summed it up very succinctly today: Christ proved with his Resurrection that he is no longer bound by the physical, material limitations of our world. He exercises His Divinity in this way so that we may know that he is with us always, and he can present himself to us in surprising ways throughout our life. The priest gave examples of the poor man you meet on the street, the troublesome coworker, or your family and friends… all of these can be ways to experience Christ in your life. He’s there with them just like he’s there with us. We try to pray through our work by doing it with Jesus, for Jesus, to Jesus. That helps us to put our whole heart and soul into doing it. The dying, the cripple, the mental, the unwanted, the unloved they are Jesus in disguise. This led me to dwell briefly on the photos that have graced secular media of Pope Francis kissing babies and taking extra time to bless a handicapped man in the crowd. He’s treating these people as if they are Jesus in disguise. I believe that being Christian means that we – in our sinful, fallen state – can work each day to be more and more like Christ and also recognize Christ in others. How do we do that, exactly? Simple: follow the example that Christ gave us. He lowered himself to be human like us, humbly accepted the Cross and forgave the people that ultimately would crucify Him, and He was obedient to God’s Will even to the point of death. We can lower ourselves by understanding that we live in an imperfect world with imperfect people. We can be obedient by loving our neighbor and recognizing that they too are carrying their own Crosses. We can be like Christ when we forgive those that wrong us, truly understanding that the people we meet are Christ presented in a shockingly human disguise. So the secular world can have it’s strange amalgamation of rabbit metaphors and marshmallow chicks, I would much rather spend my time reflecting on one of the greatest mysteries ever to reveal itself to humankind. For those of you that don’t know, I am a proud 4th degree member of the Knights of Columbus. The Knights are a charitable, fraternal organization built around the core principles of charity, unity, fraternity, and patriotism. In addition, they require the men in the organization to be “practical Catholic gentlemen” meaning that we live in accordance to the Church teachings and follow the lead of the Magisterium. 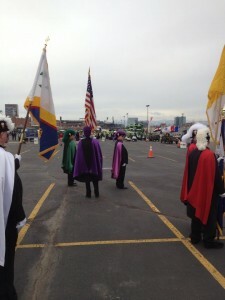 This year, I had the opportunity to participate in Denver’s nationally televised Saint Patrick’s Day parade. The photo included on this post is us arranging our formation in the staging area. We had about nine Knights in regalia (the chapeau, cape, sword, and baldric) leading two floats from Knights of Columbus councils in our area and cars containing dignitaries from our State Council and State Ladies Auxiliary. Suffice it to say we had a very impressive showing. The road narrowed a little, which brought the crowd very close to our formation. I don’t know if it was the sea of green shirts and waving arms, or the fact that the crowd was very close to us, but I was reminded of the flashback scene in Passion of the Christ where Christ and the Apostles were welcomed into Jerusalem on Palm Sunday. I spent much of the rest of the parade thinking about what it must have been like for our Lord to go through the cheering crowd knowing what was in store for him later that week. As I thought about the rest of Holy Week, I was thankful that I would likely only have sore muscles and a stiff back at the end of my walk through a crowd and would not have to endure anything like Christ would. I am always grateful when I am reminded in small ways like this of the life of Jesus. It helps me to reflect on what He went through for us, to feel closer to Him, and to strive to be more like Him in life. This is one of many different ways that being a member of the Knights of Columbus has helped me draw closer to The Lord. If you are a Catholic man that observes Church teachings and wants to further their faith, I strongly suggest that you find your local Knights of Columbus Council and inquire about becoming a member. Next Saturday, my cousin-in-law Aaron will complete his long road through the Rite of Christian Initiation for Adults (RCIA) process and officially join the Catholic Church. For those unfamiliar, the RCIA program is the process by which adults become full members of the Catholic Church. It came as somewhat of a surprise when I heard that he had entered catechesis and the RCIA program last year. Since I left Illinois for Colorado, I am often insulated from some family news and this one didn’t reach me until late last year, when I heard this news from my cousin Shanna (Aaron’s wife). I quickly found out that Aaron was taking to the RCIA program with great zeal, and growing deeper into his faith by leaps and bounds. I must say this came as a relief. I got to sponsor my wife (then girlfriend) through the RCIA program at the local Newmann Center at college, and let’s just say the program lacked the same type of intellectual rigor that Aaron is experiencing. He explained to me the variety of classes, reading assignments, lectures, and rock-solid formation that they are doing in the Pekin, IL and I was tremendously excited to hear all the good work being done for the this class of catechumens. 1. Live the Sacramental Life. This should go without saying, if you had a very in-depth RCIA experience… but live your life within the context of the Sacraments. Ask yourself each week if you are in a state of grace enough to receive the Eucharist. If not, go to Confession and experience God’s Divine Mercy. If you’re married respect your marriage vows, honor your wife and raise your children within the Faith like you promised. Make worship of God through Christ and the sacramental signs he gave us central to your life. 2. Stay strong in your Faith! I’m sure throughout the RCIA journey, you have met some pretty incredible people. There’s nothing that says you can’t invite one of them over for dinner, or go out for coffee, or continue the friendship after the Easter Vigil is over. If you’re like my cousin and I, you may even have discovered another “secret” Catholic in your existing family or circle of friends. Lean on that person for support, especially if questions crop up after you have been practicing your Faith for awhile. Use each other to keep accountable for continuing down the important journey that you’ve begun this Lenten season. 4. Lead your home to God. With any luck, your family has gotten to see a transformation in you as you’ve completed your journey through RCIA and now would be an opportune time to help them further their Faith. Have family dinners together. Pray together. Read religious books or watch religious movies and discuss them together. Instead of carrying on through our busy lives, try to make home a peaceful place that affords at least a little opportunity for prayer and reflection. Heed Saint Augustine’s words and lead your family to God. 5. Lead others to God too. I have found that new converts to Catholicism bring special gifts to the Church. Share the story of your conversion with others. Utilize the good gifts that you received from your past religious affiliations to bring new perspectives into the Church. Some may have come from a more Bible-oriented form of Christianity, if you did you might be able to lead the best Bible study that a cradle Catholic has ever seen. Some might have been from a more charismatic background, these folks are cut out to help lead parish ministries or assist the poor. Others may have come from a completely different worldview, such as atheism or agnosticism. These people bear a truly valuable story for our society: the story of how they came to have faith.If you feel like you don’t have any special skills, the best way to lead others to God is through your actions. Don’t become a pew-sitter, get out there and help unload boxes into the food bank for the poor, or participate in a ministry to learn more. Get up and talk about your experiences with your priest, or ask him if he has any other ways that you can live your faith. It isn’t enough to simply have Faith, because in living our Faith we truly open up the opportunity to help those in need and lead others to God. Don’t be afraid to talk to others about your conversion. Perhaps the only conversation anyone will ever have about Catholicism is the one that you initiate. If you had a good RCIA program that contained some apologetics, you might even be able to answer some of their common objections. If you are interested in learning more about apologetics so you can effectively talk to others about the faith (and are prepared with some of the more common objections), check out Catholic Answers. I have to take this opportunity to say how proud I am of my cousin, Aaron. I am impressed with the zeal that he shows for the Catholic Church, and I know that he is going to provide a sterling example of how to live a strong, vibrant Catholic life. Even though I can’t be there when he comes into the Church, I will definitely be there in spirit and in prayer.I am excited for the next chance I have to sit down and talk with him about his experience in joining the Church, I know it is going to be a compelling story. We’re just a few short hours from the beginning of the Lenten Season, which runs from Ash Wednesday (tomorrow) until Holy Thursday. It is a season of prayer, penance, repentance, almsgiving, and self-denial in preparation for the great celebration of Easter. Ash Wednesday and Good Friday are fasting days, which restrict the eating of meat and snacking between meals. All Fridays during Lent are days of abstinence from eating meat but fish and shellfish are permitted. Can. 1249 All Christ’s faithful are obliged by divine law, each in his or her own way, to do penance. However, so that all may be joined together in a certain common practice of penance, days of penance are prescribed. On these days the faithful are in a special manner to devote themselves to prayer, to engage in works of piety and charity, and to deny themselves, by fulfilling their obligations more faithfully and especially by observing the fast and abstinence which the following canons prescribe. Note Canon 1253, which mentions the substitution of other forms of penance or works of charity and piety… it has been encouraged by the Church to go beyond the letter of Canon Law and deepen your faith in a more significant way during Lent, and over the past few years I have been doing a little more. Give up soda, including my beloved Diet Coke. Thankfully, my wife Tasha is doing the same thing so it will be easier but I am NOT looking forward to the withdrawal headaches that I always get. Read Summa Theologica by Saint Thomas Aquinas. I have only barely started and this is going to be a challenge. Saint Thomas was a very deep thinker and it’s going to be a battle for every one of those 550 pages. Follow the Discerning the Will of God Lenten Journey by Steve Bollman (from That Man Is You!) to the best of my ability. It involves the following each day: morning and evening prayer, an activity or observance, Scripture reading and a rosary. If I get through all that I will continue reading Pope Benedict XVI’s Jesus of Nazareth series. If you’re doing something special for Lent this year, let’s hear about it in the comments. I enjoy hearing what others find important to sacrifice or observe during this important season.